A businessman has pleaded guilty to defrauding the EU and Welsh Government after claiming £4.7m in grants to develop an alternative to fish feed. The venture was supposed to create up to 120 jobs, but Anthony Smith, 72, created seven positions and used the money for other purposes, Cardiff Crown Court heard. 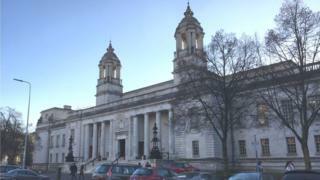 Smith, from Port Talbot, pleaded guilty to three counts of fraudulent trading. Two others admitted their involvement at separate court hearings. After the hearing, Janet Potter from the CPS specialist fraud division, said Smith had "promised to make Wales a world leader in the aquaculture industry, but instead he abused the system". "Not only did Anthony Smith wildly overstate how much money had been spent, but he made up stories about projects which never existed," she said. The money was approved in 2006 to help develop a plant to process ragworm for bait, and ponds in which to rear them in Port Talbot and Pendine, Carmarthenshire. Ragworm is used to make fish food for the commercial sector and is a source of protein. But Smith failed to carry out his obligations and used the money to purchase machinery that was not part of his original application for his firms; Dragon Research, Dragon Feeds and Dragon Baits. Smith's previous business ventures included breeding worms for anglers which won environmental awards. Colin Mair, 68, of Coningsby, Lincolnshire, who helped Smith run Dragon Research, admitted one count of fraudulent trading at a separate hearing. And Keith Peters, 72, of Swansea, a retired chartered accountant, admitted two counts of false accounting. The three will be sentenced on 10 May. A Welsh Government spokesman said: "We co-operated fully with this investigation to ensure that public money was recovered and protected, and tightened procedures to reduce the risk of this type of fraudulent activity happening again."